Damhouder, Joost de. Praxis rervm criminalivm : elegantissimis iconibvs ad materiam accomodis illustrata, praetoribus... Antverpiae : excudebat Ioannes Latius, M.D.LVI . 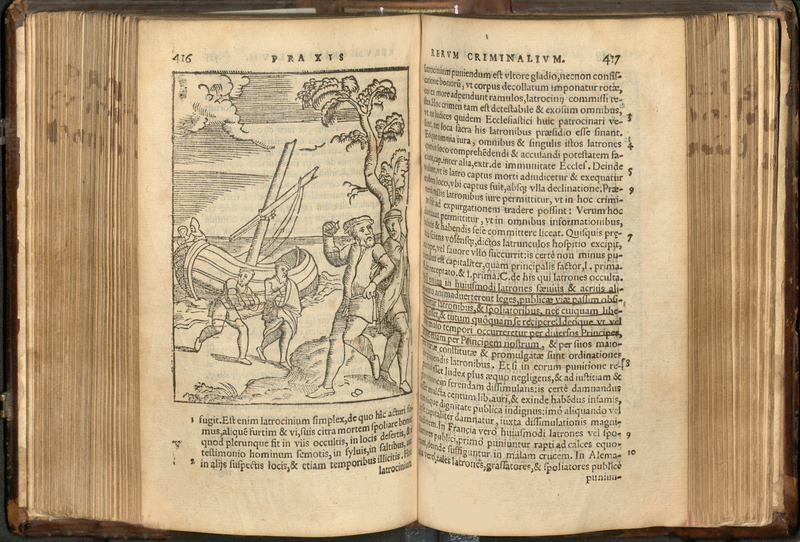 Among the Tarlton Law Library's collection of rare books and legal materials is one 16th century imprint that is visually engaging to modern law students. 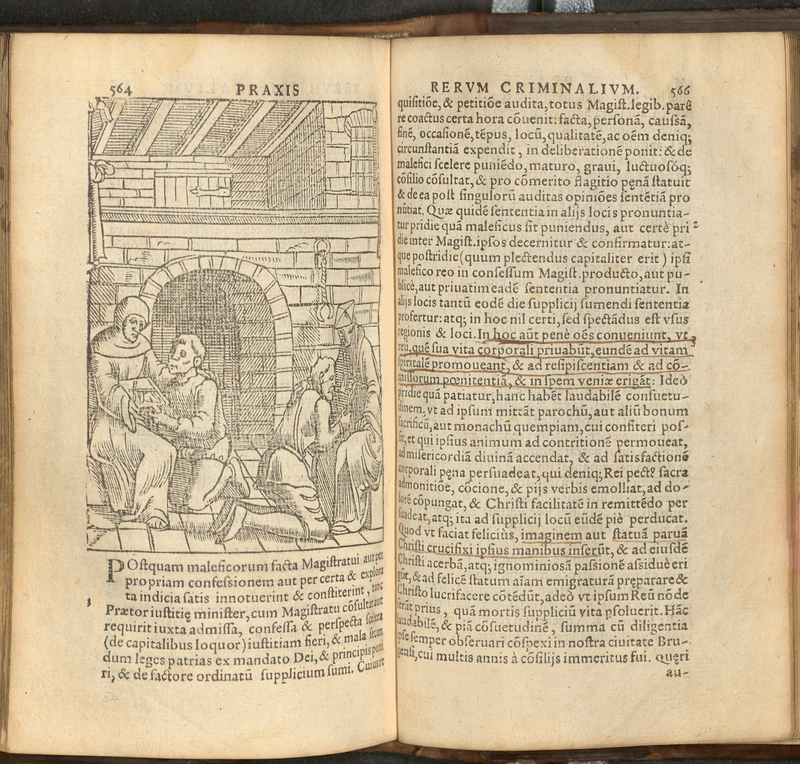 The Praxis Rerum Criminalium, by Joos de Damhouder (1507-1581), was the standard manual on criminal law in Europe for over a century, going through multiple editions and translations, but it is most well known today for its 56 detailed woodcuts depicting the crimes and criminal procedures of early modern Europe. Joos de Damhouder was a jurist and prolific author who worked in Bruges as an advocate and legal adviser for the city from 1537 until 1550 when he was appointed the clerk of the Bruges Criminal Court. 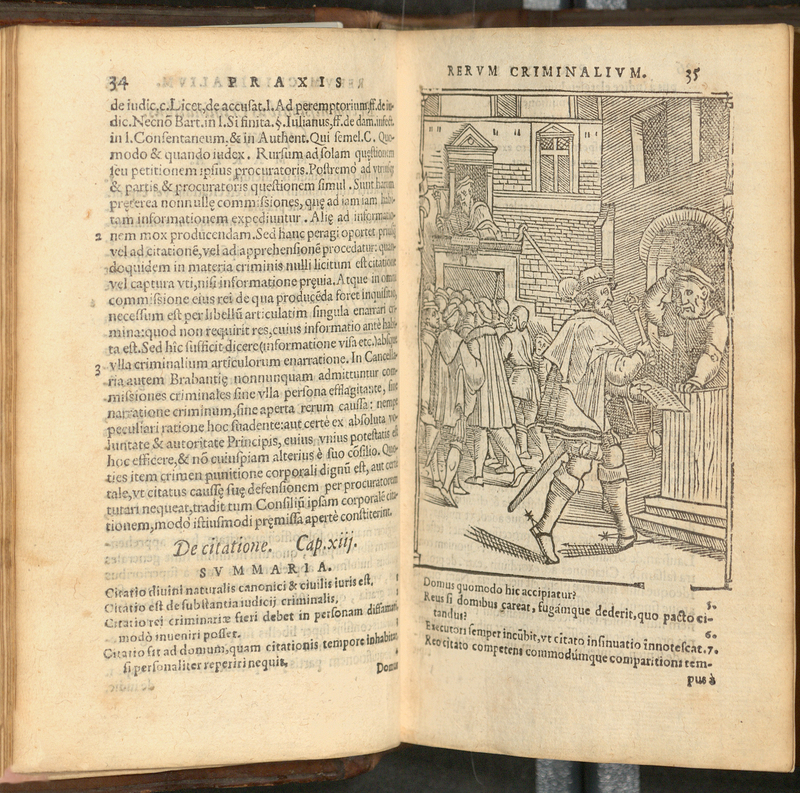 The Praxis Rerum Criminalium, de Damhouder’s primary work, was first published in 1554, four years after he began serving as clerk. His experiences in the criminal court evidently demonstrated the need for a practical manual of criminal procedure in his jurisdiction, dealing comprehensively with the crimes he saw come before the court. 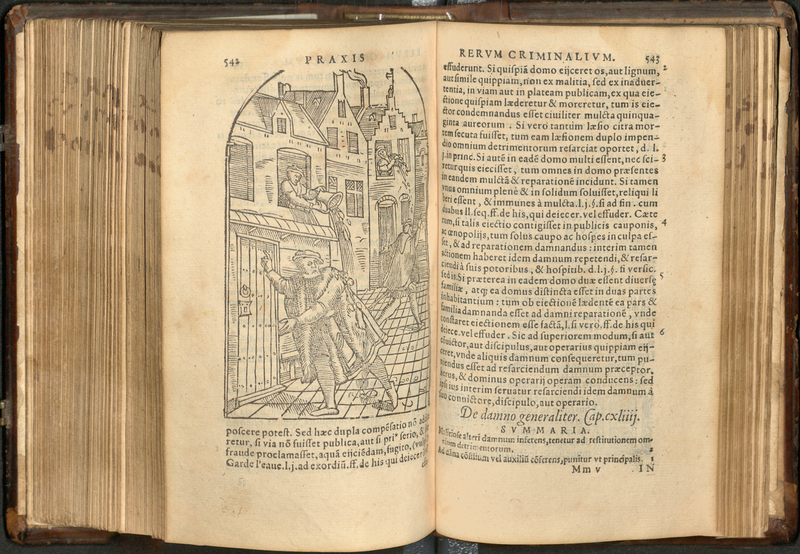 De Damhouder based much of his work on Flemish lawyer Philips Wielant’s Practycke Crimineele (1439-1519), an unpublished work intended as an instruction manual for lawyers, judges, and court officials. De Damhouder translated Wielant’s work into Latin and integrated the Roman laws with Flemish customary laws. The Praxis begins with a practical description of the process of a criminal trial, from the initial accusation or inquisition through the charges brought against the defendant, the laws of evidence, torture, confession and finally the rendering of a verdict. The stages of the legal process are brought up again at the end of the work, with sections addressing pardons, appeals, revocations of exiles, and the execution of sentences. 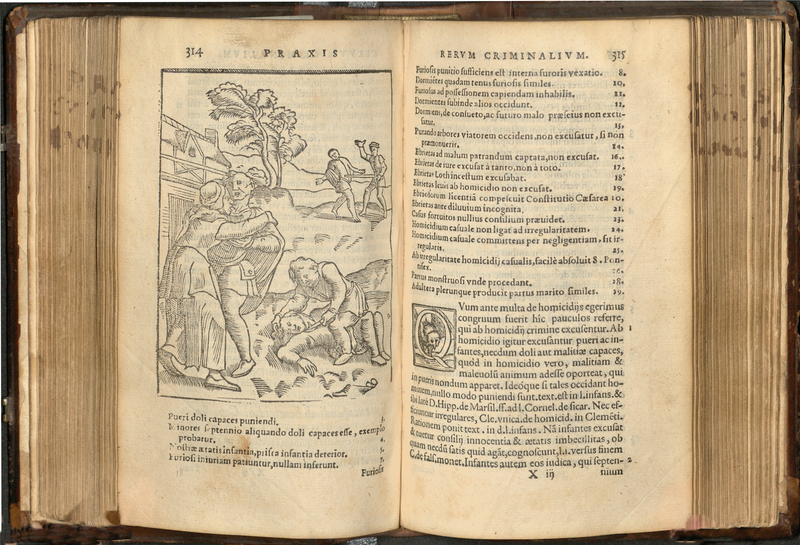 The central text of the Praxis comprises exact descriptions of criminal acts, from theft, adultery, and homicide to blasphemy, gambling, and improper disposal of waste within the city walls. De Damhouder’s great innovation was in the clear illustrations of these various crimes and subsequent legal procedures. 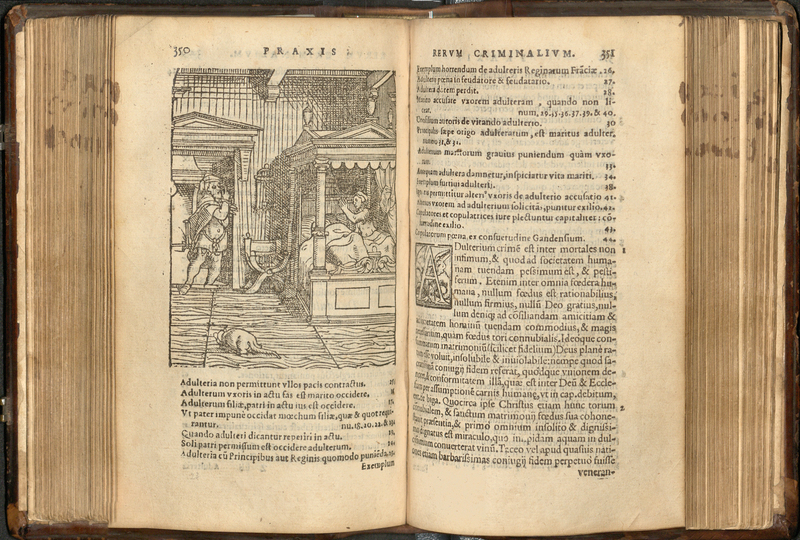 The 56 woodcuts, alternately charming and disturbing, offer a rare window on city life in late medieval Europe. One aspect of de Damhouder’s work modern law students will not find reflected in their own curriculum is the extensive section dealing with identifying and prosecuting witches. De Damhouder, drawing on his own court experience, became concerned that many witches escaped prosecution through judicial incompetence. 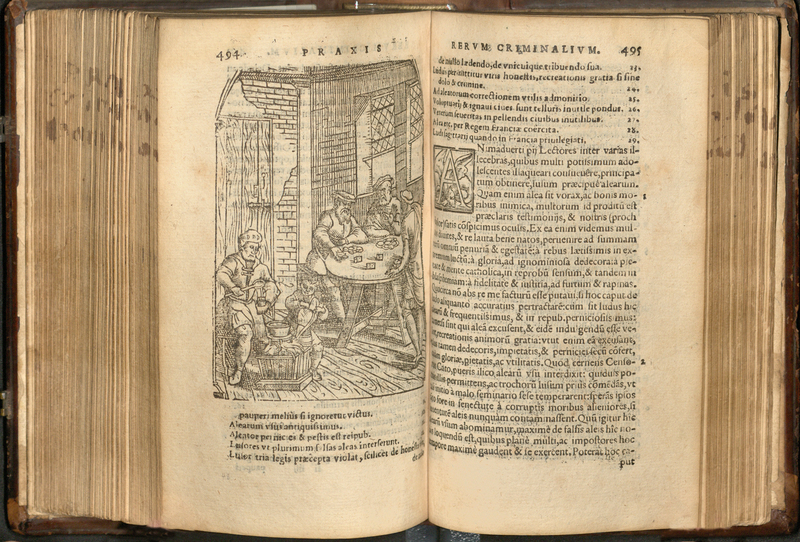 The Praxis includes illustrations depicting the proper way to conduct interrogations of suspected witches under torture and was often cited in the witch trials of the 16th century. 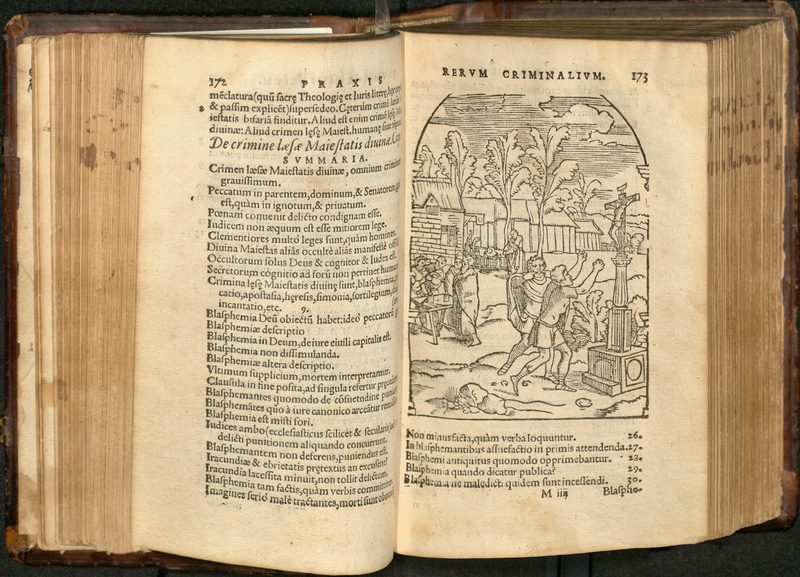 The woodcut to the right illustrates the confession and repentance of witches. Tarlton's imprint of the Praxis is only about seven inches tall, the size of a modern paperback. It's bound in stamped leather with a floral design depicting goddesses of wisdom and beauty. The small size and clasp binding suggest this imprint was intended for a utilitarian use but the well-preserved condition of the nearly 500-year-old volume shows the book had careful owners throughout its history. Handwritten notes and a signature are included on the endpapers and underlining and annotations can be found throughout the text.